Joyce Magnin combines the ridiculous with the poignant in a way that spells sublime. 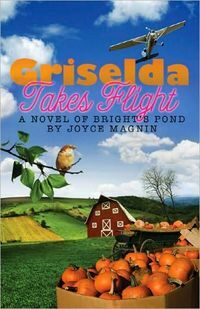 And that’s especially true of Griselda Takes Flight (Abingdon, releases 4.1.11), the third offering in her Bright’s Pond series. No one but Magnin could put together a comatose treasure hunter; his not-so-concerned fiancée; an obsessive pumpkin farmer; two sisters learning to love their way out of dysfunction; and a pilot who makes an emergency landing and decides to stay a while. And no one but Magnin could weave all these and more into a loveable, believable, page-turning story. In what’s become her signature style, the author uses flawed characters and awkward, often humorous situations to teach powerful lessons. Griselda Sparrow, who takes flight in not only an airplane but her self-confidence, shows readers the power of truth to set free. And as other Bright’s Pond residents work through their own versions of truth-telling, readers will no doubt do the same. At one point in my reading, I realized I was holding my breath. Charlotte Figg, heroine of Magnin’s second novel, was about to encounter Griselda and friends for the first time. My concern for my fictional friends defined my discovery about their creator: Oops, she did it again. Read it and smile. Because when Griselda Takes Flight, your heart will, too.